Steve McCloud grew up in Indianapolis, Indiana and began playing music in bands at the age of 13. At age 21 Steve hit the road playing in various bands, departing from Indiana and heading out across the mid-west and then travelling south. By the mid – 80’s, Steve had travelled and played in about 30 of the lower 48 states and at age 27, found himself somehow transported (by boat) to a small private resort island in South Florida called Cabbage Key. Steve landed a year long solo gig playing acoustic guitar and singing in the Tarpon Lounge, playing the songs of Jimmy Buffett and other folk and tropical folk artists. Steve says he, “fell in love with the islands, the ocean, the lifestyle, the music and the people.” His year on the island was followed by a few years of gigging as a one man band in Indiana, Florida, Louisiana and Mississippi. Steve is now living the good life in Louisiana, where he has lived for the last 25 years in the beautiful town of Pollock, Louisiana, or as Steve calls it, “Parrotville”. The weather in Parrotville is pleasant most of the year and Steve has earned a reputation for wearing flip flops everywhere he goes … so the name Flip Flop Man has become the perfect pseudonym. Steve says, the Flip Flop Man stage name exemplifies a lifestyle and attitude that he wants to communicate through his music and casual performance style. 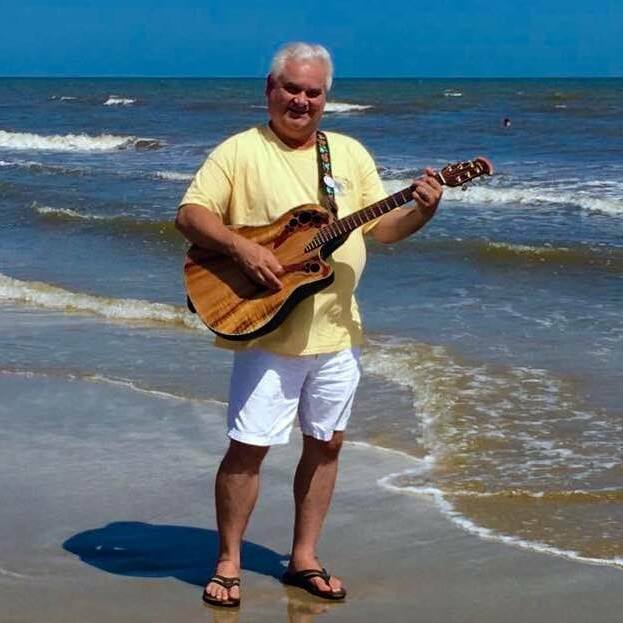 The Flip Flop Man launched his new show in December of 2012 in Central Louisiana and has been treating his listeners to a great time of music and memories at each concert. The style of Steve’s music is called Coastal Americana, some will call it Trop Rock or Yacht Rock, whatever you call it though – it rocks with a Key West feel!! Flip Flop songs are often familiar favorites and audiences may find themselves singing along and smiling often. To keep tabs on The Flip Flop Man, you can follow his Facebook page by visiting www.facebook.com/theflipflopman – click the link, ‘LIKE’ the page and please say hello. Check out links to many other Tropical sites and cool videos while you’re there. Please enjoy the rest of this website and leave us your contact info, we would like to stay in touch with you. Fins Up … from Parrotville ! !